Herding cats and other metal puzzles. A new version of Dai Nagata's Cat Packing Puzzle has been released by Bits and Pieces. Puzzlemaster.ca recently released a combined set of three of the best Cast puzzles: Loeuf, Radix, Disk. Pentangle has also started carrying the Cast lineof metal puzzles. Bill Gosper mentions a nice puzzle: pack 18 4x4x1 blocks in a 7x7x7 box. Patrick Hamlyn follows up with 12 4x4x1 blocks and 3 2x2x2 cubes in a 6x6x6 box. Andrew Clarke: I've just started a new page based on pieces formed by adding to the square tetromino. It's at 4sqplus.htm. Some of the sets are quite interesting and allow for multiple rectangle as well as multiple simial figure constructions. Some of the multiple rectangles will be quite hard to find if not impossible. jjartus: I wish to call your attention to the game called Trinim. Numerous questions are unsolved, for instance which is the exact number of different (non equivalent) starting configurations for each size? (rotations, symmetries, color rotations and exchanges(g -> b -> r), are equivalent). There is a rough estimate for n=5. Can a general formula be written for any allowed size? The game is very complex, and there is so far no perfect player, human or computer. Which are the winning strategies? Is there a simple way to determine whether a board is a winner or a loser for a perfect player, aside from brute force tree analysis? The game is played currently with 3 colors, but games with another number of odd colors are possible. A fractallic visualization of tic-tac-toe can be seen within the webpages of Fractal Images of Formal Systems by Paul St. Denis and Patrick Grim. I had the pleasure of meeting David Krumholtz, Dr. Gary Lorden, Cheryl Heuton, Nick Falacci, Andrew Black, Bill Nye, and Keith Devlin at the recent AAAS conference. The coolest moment was a discussion with Bill Nye and Andrew Black over a plate of water and pepper as a possible moment in the show, and Bill Nye talking about how he first saw the experiment while watching the original Mr. Wizard, then following up with a wicking experiment. I shoulda brought a tape recorder with me. David talked about the challenges about portraying a math genius and how honored he is to be the face of promoting mathematics. Cheryl and Nick discussed the steps of getting the show made in the first place, and the unexpected successes they had every step of the way (the show now being #15). Gary Lorden talked about some of the actual math in the show, and showed many clips from the show, pointing out various items even I missed. Fun stuff. Here's a different Numb3rs article, from Zap2it. Gordon Royle has found a Sudoku X puzzle with 13 clues. Also quite interesting is his list of Psuedoku puzzles with 16-clues, and with from 2 to 9 solutions -- it's the post that starts "Here are the pseudo-Sudokus with low numbers of completions." The next Al Zimmermann Programming contest, for Prime Generating Polynomials, will soon be starting. Here are some current records. Christopher Bird: Consider the sequence of 'number' equations. The largest possible 'number' equation in this sequence where solutions are still possible is S+E+V+E+N+T+E+E+N = 17. This leaves a small set of solutions. However, when N+O+U+G+H+T = 0 is included, we get a unique solution for each and every variable used in the problem. N+O+U+G+H+T=0, O+N+E=1, T+W+O=2, T+H+R+E+E=3, F+O+U+R=4, F+I+V+E=5, S+I+X=6, S+E+V+E+N=7, E+I+G+H+T=8, N+I+N+E=9, T+E+N=10, E+L+E+V+E+N=11, T+W+E+L+V+E=12, T+H+I+R+T+E+E+N=13, F+O+U+R+T+E+E+N=14, F+I+F+T+E+E+N=15, S+I+X+T+E+E+N=16, S+E+V+E+N+T+E+E+N=17. The furthest in the Greek alphabet that we can go where solutions are still possible is T+A+U = 19 (19th letter). This leaves a small set of solutions. However, when the final letter in the 24-letter Greek alphabet O+M+E+G+A = 24 is included, then, once again, we would be left with only one and an unique solution for each and every variable used in the problem. A+L+P+H+A=1, B+E+T+A=2, G+A+M+M+A=3, D+E+L+T+A=4, E+P+S+I+L+O+N=5, Z+E+T+A=6, E+T+A=7, T+H+E+T+A=8, I+O+T+A=9, K+A+P+P+A=10, L+A+M+B+D+A=11, M+U=12, N+U=13, X+I=14, O+M+I+C+R+O+N=15, P+I=16, R+H+O=17, S+I+G+M+A=18, T+A+U=19, O+M+E+G+A=24. An even more difficult problem than the Greek Alphabet set of equations is the set concerning the NATO Phonetic Alphabet, which is most commonly used in radio communication. Amazingly, even though we have a full set of 26 equations (one for every letter of the alphabet), we nevertheless have an unique solution to each and every letter-variable from A to Z (all 26 letters are represented, making this a classic problem). A+L+P+H+A=1, B+R+A+V+O=2, C+H+A+R+L+I+E=3, D+E+L+T+A=4, E+C+H+O=5, F+O+X+T+R+O+T=6, G+O+L+F=7, H+O+T+E+L=8, I+N+D+I+A=9, J+U+L+I+E+T=10, K+I+L+O=11, L+I+M+A=12, M+I+K+E=13, N+O+V+E+M+B+E+R=14, O+S+C+A+R=15, P+A+P+A=16, Q+U+E+B+E+C=17, R+O+M+E+O=18, S+I+E+R+R+A=19, T+A+N+G+O=20, U+N+I+F+O+R+M=21, V+I+C+T+O+R=22, W+H+I+S+K+E+Y=23, X+R+A+Y=24, Y+A+N+K+E+E=25, Z+U+L+U=26. Hex-a-hop is an excellent free puzzle game by Tom Beaumont. Basically, on small boards, you hop around to destroy green tiles. Very simple conceptually, but very attractively laid out, free, and filled with ingenious puzzle miniatures. Deflexion is an interesting game of lasers and mirrors. It's a physical board game. Erik Hermansen, the creator of the DROD: Journey to Rooted Hold, puzzle game of the year, invites all to participate in his Feb 20th Deflectamundo contest. I learned about this and Hex-a-hop from Erik's wonderful monthly puzzle recap. Eric Solomon is the inventor of Black Box, the original deflection game, and he has a great java site. And he's a regular contributor here, so I feel obligated to mention him after two other deflection games. Puzzleup has started a second year of weekly puzzles. The ten countries puzzle given this week is quite nice. Dave Millar, a frequent contributor here, has launched a puzzle-of-the-day site called The Griddle, devoted to grid-type puzzles. With scads of help from Serhiy Grabarchuk, Eric Weisstein, and OEIS, I've made a Kobon Triangle update. Solutions are now known for 13 and 15 lines. Andrew Clarke has updated his Poly Pages with an article by Edo Timmermans -- Polyominoes Inside Circles. About a year ago, across the hallway from me, MathWorld teammember John Renze managed to get a program working that proved a new Fibonacci Prime. Now, that method is "An Algebraic Approach to Primality Proving", and it's getting increasing attention as a breakthrough. M. Oskar van Deventer: A couple of weeks ago, I wrote you about the Fractal Jigsaw. Recently, I made a prototype on the laser cutter of Peter Knoppers. The puzzle is a quite powerful optical illusion. When you take out a big piece, and put it next to the hole, it is very clearly visible. When you give it a tiny push to make it drop into the hole, suddenly the piece completely disappears, hidden in the fractal pattern. George Sicherman has Oddified the elusive K pentahex. Nick Baxter invites US residents to try out for the World Sudoku Championship. Get a stopwatch ready, then head on over to that link. You'll be able to download an excellent selection of variety Sudoku puzzles. To possibly join the US team, write down your solving times. Then enter those times in the registration form. If you're one of the fastest solvers, you'll be given an opportunity to pay for your own flight and hotels in Italy, for the World Championship. A new puzzle at Puzzle Beast involves moving plates of Okra and other goodies. It can be surprisingly difficult to get hot okra, when the plate is large. Oskar van Deventer has added a new puzzle at Click Mazes, Oskar's Jukebox. You just have to put coins into the machine. How hard could it be? The Wolfram Technology Guide caught me completely unawares -- I didn't find out about it until it got mentioned in Nikkei Science, the Japan version of Scientific American. There are some interesting Flash demos of mathematical things even I didn't know about. After watching several, I eagerly clicked on Sparse Arrays, to see the zippy flash demo for that. Alas, just a chart there. Take a regular polygon, and draw all the diagonals. Other than at the center, what's the most lines that can meet at a point? The answer is in a recent paper by Bjorn Poonen and Mike Rubinstein. In this month's Math Magic, Planar Distance Graphs are the main focus. One problem for this month -- what is the smallest planar graph that has edges of length 1, 2, and 3 connected to every vertex? Here's another problem -- a graph with unit edges, three edges at every vertex, and no triangles. If you can solve that, head over to Math Magic and share your skills. 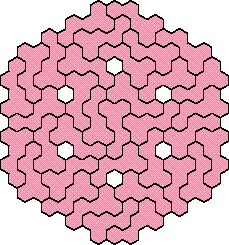 Peter Esser, who runs the wonderful Peter's Puzzle and Polyform Pages, has added an SVG option to his Polyhex solving program. 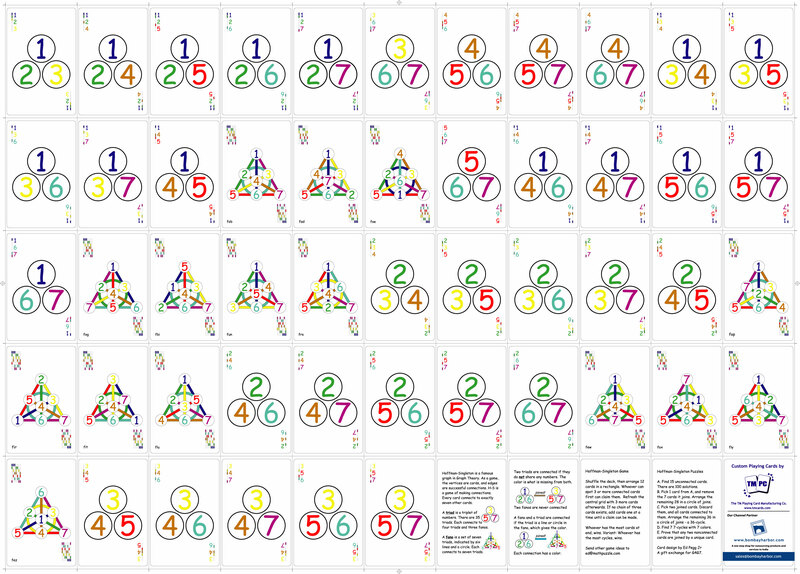 I've long wanted to make a mathematically perfect card deck. Now, a basic card deck is 4x13, basically. Not really much better than 5x12, or 4x14. The game of Set is 3^4. Why not 4^3? Well, no-one will be able to top the Hoffman-Singleton graph for mathematical properties. And now, it's a card deck. I'll be giving away 250 copies to attendees of G4G7. Another 250 copies I'm selling here, for $10 each. If you'd like to reserve a deck, click on the PayPal button on bottom of the left column. Feel free to add a donation if you like my site. The latest MathTrek mentions my involvement with Numb3rs. Ivars should have also mentioned Michael Trott and Eric Weisstein. 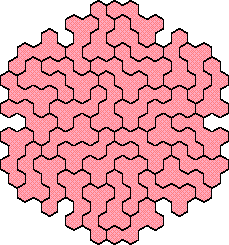 Master tessellator Robert Fathauer has added some beautiful new pages about Fractal Tilings. TpX, one of my favorite free vector programs, just came out with version Tpx 1.3. I just recently learned that it can accept TeX input in its diagrams. Serhiy Grabarchuk: I've just updated my website www.ageofpuzzles.com adding a lot of new materials. Lots of interesting pictures of complexity are listed at visualcomplexity.com. Math is starting to get more popular in the media. Business Week ran the article Math Will Rock Your World. I was at the bookstore earlier today, and saw about 30 near-identical Sudoku books. Bob Harris is doing stuff more interesting than anything currently findable in the stores. Recently, he proved that n-1 clues are sufficient for any n-sized geometric sudoku. I've gotten lots of circle packing news lately. First, at the Joint Math Meeting I picked up the beautiful book Introduction to Circle Packing by Kenneth Stephenson. I got to read a circle-packing paper by his student, Brock Williams. Doug Hensley presented a paper on Circle Packings and Complex Continued Fractions. On top of all that, the Al Zimmerman Circle Packing Contest finished up. There are pictures of solutions at EngineMonitoring, at FileLodge (svg), a two-level strategy (PDF), Tom Rokicki solutions (PS), All submissions (Zip), Steve Trevorrow's pictures, the Final Report, and Solution Testing. Rodney Mason -- Ed, I enjoyed this book so much. Thank You. I liked it so much I converted it to PDF format with bookmarks so it is a little easier to read and find the answers. Please feel free to post the pdf (40Meg PDF) on your Math site or do what ever you want to with it. In 2005, Gordon Royle compiled many 17-clue Sudoku with unique solutions. Gordon a careful analysis of them, and isolated a 16-clue Sudoku with exactly two solutions. So far, this is the only 16-clue Sudoku found with just 2 solutions. Is there another that isn't a trivial variant of this one? Gordon Royle's 16-clue Psuedoku (two solutions). Is it structurally unique? A Turing Machine has been made with Lego. David Millar had an idea for some new chess pieces. Here is one of them, the BullRider. He asks how many moves are needed for the BullRider to capture the Black King. Not too hard. What other games and puzzles are possible with this piece? Jacques Tramu noticed that 2006 is interesting in base 3. It's 2202022. The latest Math Magic has some new questions about Partial Partriage Packing Problem. Erich also offers a puzzle: insert standard math symbols in the below numbers to get an expression equalling 2006. Answer and Solvers. A new puzzle magazine has started, P&A Magazine. It is a joint effort by several top-notch puzzle constructors. My latest Math Games column is about my favorite math references, and various useful math reference sites. As always, if I missed anything good, please share your thoughts with me. For me, these are the pure gold books that I've found useful again and again. I'll be at the Joint Math Meeting in San Antonio, Jan 12-15. I'll be at the Wolfram Research booth, along with Eric Weisstein and Michael Trott. Feel free to stop by to see me, if you're there. The organizers have put a Gallery of Mathematical Art online which is well worth a look. The Hanayama Cast Puzzles are some of the best puzzles in the world. THey have been hard to order, though, especially due to all-japanese order forms. PuzzleMaster.ca has now made these puzzles available on their site. I especially recommend the Radix puzzle, pictured below. Another metal puzzle I quite like is Oskar's Lucky Clover. Ryohei Miyadera, Daisuke Minematsu and Munetoshi Sakaguchi present a problem: given the below pieces of chocolate, where the red triangle is very bitter. Two players in turn break the chocolate (in a straight line along the grooves) and eats the piece he breaks off. The player to leave his opponent with the single bitter part is the winner. Describe the stratedy to ensure winning. They wrote up an excellent PDF and Mathematica notebook with the answer. Other good work they've done includes an analysis of Russian Roulette. I wrote a column about DROD: Journey to Rooted Hold - a great puzzle game (which I completed!). I later learned that no less than 5 Math Olympiad finalists were all DROD fans. After winning a spot in the top 10 Indie Games of the Year, DROD got coverage on Penny Arcade, Slashdot, GameTunnel, and Adrenaline Vault, and other sites, which allowed DROD to have a great start for 2006. They recently had a contest on Hermetic Puzzles which is well worth a look. From Bernardo Recaman: Place the numbers 1 to 16 in the cells of a 4 x 4 grid so that no cell is the sum of a subset of its (up to 8) neighbours. Thus, 5 couldn't have both 1 and 4 as neighbors, or both 2 and 3 as neighbors. Answer and Solvers. Peter Esser took up my challenge to make some SVG Polyforms. In this case, it's the gorgeous Erbium puzzle,which he bought on Ebay. You'll need Firefox or Inkscape or some other Vector program to look at it. in related news, Andrew Clarke has explored polyhexes making triangles. In other polyform news, the Crossing the Board competition looks very interesting. After the discovery of a 15 line Kobon Triangle solution by T. Suzuki, several recreational math groups in Japan have taken up the problem. Recently, a promising 11-line solution was found, with 32 triangles. 33 triangles is the theoretical maximum. Ten Greater Than Sudoku's can be found at Ralph Merridew's site. In many places there is news about Steve Hofmann solving Kato's Conjecture. To some extent though, the media has overblown the accomplishment, which led to him posting further explanations on his website. NJA Sloane, with help from Russ Cox, has announced a new lookup page for the Encyclopedia of Integer Sequences. I've been interested in getting an exact solution for the Harborth Graph. Most images of this seem to be third or forth generation copies, so I've been interested in getting an exact solution. I used Compass and Ruler to make an interactive version of this graph. Can someone find an exact solution, similar to that for the Graham Hexagon?